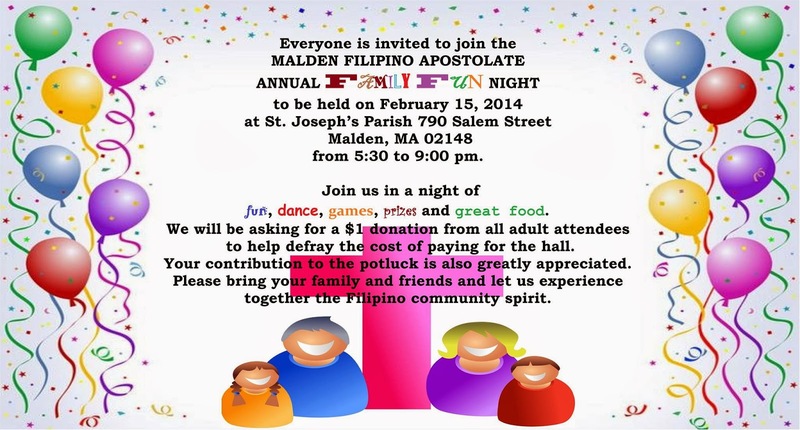 Everyone is invited to the Christmas Mass and Party of the Filipino Apostolate on December 14, 2014 at St. Joseph's Church in Malden, MA at 12:30 pm. There will be great food, fun and games as well as the very first Filipino Apostolate Got Talent competition. The contest is still open to all talented young people until the age of 18.Send your information to jeffrey.pagulong@gmail.com. Deadine of submission of entries is on November 30th. Great prizes await the winners. In memory of our dearly departed we will have a table in front of the church this coming Sunday Nov 9th for anyone who wishes to bring pictures of their loved ones whom they wish to honor. We will also have tea lights for us to light in their memory. Please send the names to Fatima Houchens at fghouchens@hotmail.com so that they could be included in the memory book. The Filipino Apostolate of Boston Youth Ministry invites all talented youths age 18 and under to showcase their special gift at our FILIPINO APOSTOLATE GOT TALENT contest this coming December 14, 2014 during our FA Christmas party. Great prizes will be awarded to the winners. Signup deadline NOVEMBER 30, 2014. If you have photos please feel free to email them to me and I will add them to the album. The peace of Our Lord be with you and your family! I, Fr. Cyriac C. Mattathilanickal MS, on behalf of the Filipino Apostolate of the Archdiocese of Boston, have the honor of inviting all of you to celebrate the Feast of the patron saint of the Filipino Apostolate, San Lorenzo Ruiz. In a time when family values are being challenged in the courts throughout the world, what a splendid opportunity it is to celebrate the feast of San Lorenzo Ruiz. He was martyred standing strong for family values and our Catholic faith. "Because I am a Christian, and I shall die for God, and for him I will give many thousands of lives if I had them", was San Lorenzo's own words when he was being offered life in exchange for renouncing his faith. We look forward to seeing you and your families and friends in the celebration of the Holy Mass that highlights families and our Filipino Catholic faith to be held on Sunday, September 7, 2014, 1PM at the Holy Name Church, 1689 Centre St, West Roxbury, MA 02132. Even as we celebrate families and our faith, we are also aware of numerous Filipino families who suffer without their basic needs being met, and of the myriads of needs of the whole church and those who serve her. I am grateful for your attention and your generosity. Applicants who wish to avail themselves of the services must be pre-registered. or contact the persons below. Note: pre-registration documents must be received by the Consulate 7 days before the schedule outreach. Click HERE for our flyer. On behalf of the Filipino Apostolate, I am extending an invitation to join us for fun and games at our Annual Summer Picnic. It will take place on the 3rd Sunday of August, 8/17, 8AM – 8PM, rain or shine. This year, we decided to move our venue to the Adams Field, #1 Marymount Parkway, Quincy, MA 02170. This is a potluck event, so please bring your favorite dish, dessert and drinks to share. Barbeque pits are available for our use. Also, please bring plenty of water to share with our game participants. The Apostolate will provide the paper goods. Since this event involves friendly competition, we will require a completed and signed waiver form (Available HERE) for all persons attending the annual picnic. The completed and signed waiver form will be collected at the park by assigned individuals. We look forward to your presence on this fun-filled day. Please save-the-date. Come and join us, get reacquainted with your friends and families, make new ones, and make this a wonderful day of sharing and giving! See you there! May God bless and protect you. Filipino Apostolate Lenten Retreat at La Salette, all are welcome. Pope Francis says, "Those who live a retreat in an authentic way experience the attraction and fascination of God and return renewed and transfigured in their daily lives, their ministry and their relationships." 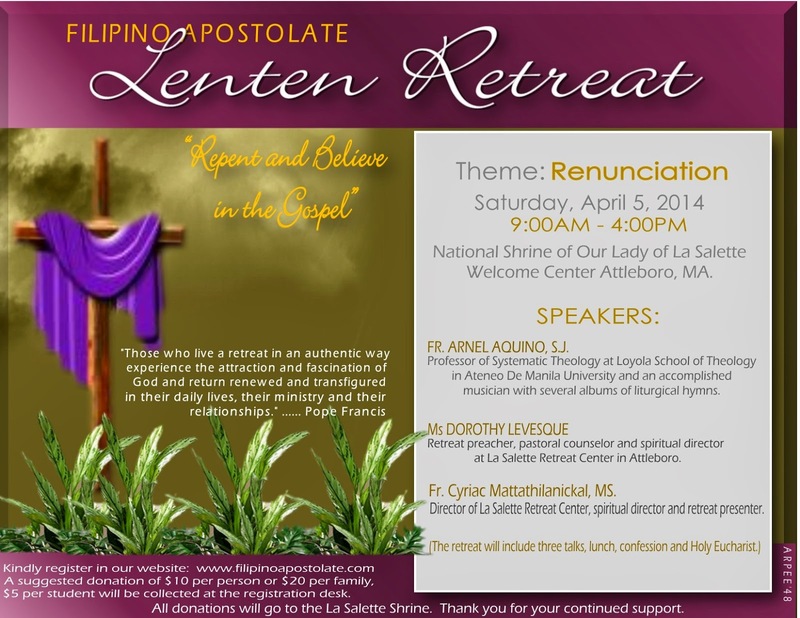 So we come together as one Filipino Community for a day of retreat focusing on the theme: “Renunciation” on April 5, 20014 from 9 am to 4pm at the National Shrine of Our Lady of La Salette Welcome Center in Attleboro, MA. The retreat will be led by Rev. Arnel Aquino, SJ, Ms Dorothy Levesque and Fr. Cyriac Mattathilanickal, MS. There will be three talks, lunch, confession and Holy Eucharist. Please invite your friends to attend the retreat. Fr. Arnel is the professor of Systematic Theology at Loyola School of Theology in Ateneo De Manila University and an accomplished musician with several albums of liturgical hymns. Dorothy Levesque is a retreat preacher, pastoral counselor and spiritual director at La Salette Retreat Center in Attleboro. Fr. Cyriac is the Director of La Salette Retreat Center, spiritual director and retreat presenter. A suggested donation of $10 per person or $20 per family, $5 per student will be collected at the registration desk. All donations will go to the La Salette Shrine. Thank you for your continued support. See you at the La Salette Retreat Center. A Filipino song for all nations who helped us! A simple, beautiful, heartwarming song of gratitude. Jim Paredes, of the famed Philippine band, APO HIKING SOCIETY composed this song. It was sang with a young 9 year old school girl, Andee Achacoso and a young woman, Dorothy Baladjay. God bless you all for your kindness! DUE TO SOME CIRCUMSTANCES, THE DATE OF OUR ANNUAL LENTEN RETREAT IS RESCHEDULED TO A LATER DAY. THE DATE WILL BE ANNOUNCED AS SOON AS POSSIBLE. WE APOLOGIZE FOR THE INCONVENIENCE THIS MAY HAVE CAUSED YOU. KINDLY VISIT OUR WEBSITE OFTEN FOR UPDATE. THANK YOU FOR YOUR CONTINUED SUPPORT. Due to inclement weather condition being forcasted for tomorrow, our Family Fun Night is cancelled until further notice. from 5:30 to 9:00 pm. Fr. Michael Harrington is inviting the Filipino Apostolate and community to attend a prayer service for martyrs of our faith on Saturday, January 25, 2 PM at the Mission Church Basilica or Basilica of Our Lady of Perpetual Help, 1545 Tremont St, Boston, MA 02120 (Roxbury). Cardinal Sean O'Malley will celebrate the prayer service. Fr. Harrington is encouraging Filipino families to join the prayer and hopes to see a large group of Filipinos during the service. He also suggested if we can wear our Filipino attire so we can be distinguished from the crowd right away. Kindly invite your family and friends to attend.